First for all let me say I am sorry this is the first update in a while. I have not fallen off the face of the planet but have been busy moving house and helping with an office move at my day job. I hope the day finds you all well and your weekend is off to the best start. Poetry has taken a little bit of a back seat of late with all the chaos that has been going on. However, what has been happening is the cover design for my upcoming book of poems, Other Silent Days. I am lucky enough to have my extremely talented other half, Heather Carr working on the art and below is a preview of the work she has been doing. I think it is amazing and captures the mood I was hoping for the book. What do you think? 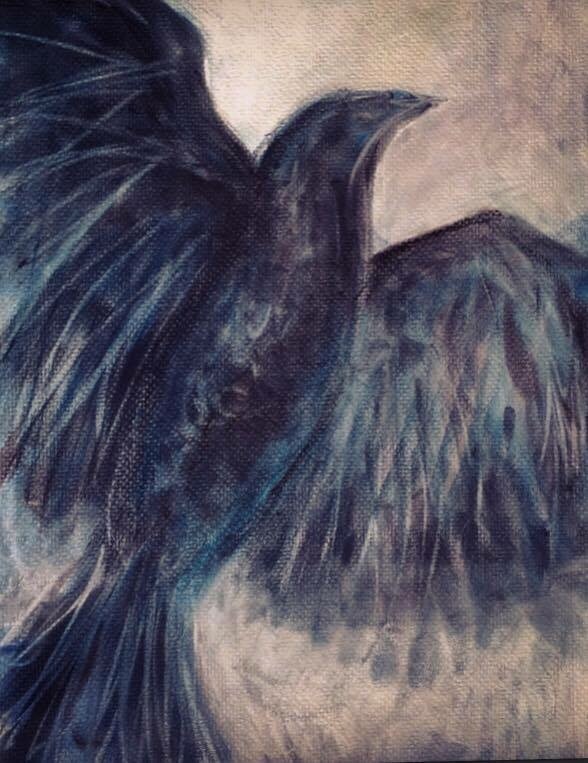 The crow is a very strong image in the book, mystical and misunderstood; symbolic in the journey that you will take while reading the poems. The book itself is split into four individual parts, each one written in a different year of my life. You will meet ghosts and sirens of the sea; feel heartbreak and hope in equal measure, and learn that the eye and the heart see things in entirely different ways. I cannot wait to share it with you all. I will be flying out to the States later on this week to spend some well earned time with Heather. I will get to see the art for the first time in person too! When I return I will be sharing more updates with you all, including when you can get your hands on a copy of Other Silent Days. Until then enjoy the art and if you like what you see, please visit Heather’s site here https://heatherunderground.com where you can find out more about Heather and her art. Thanks for all your patience and support. Love to you all. ← New Year/New Book… Soon!